This option means that database connections requested once can be used again. This increases performance, especially for highly frequented portals. If you only rarely access the configured data source, it makes sense to deactivate pooling; this will reduce unnecessary load on the database. This may also be required by the license terms of the database manufacturer, who may restrict the amount of permitted simultaneous connections. 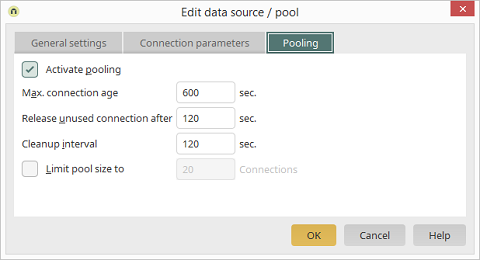 This setting allows you to define a span of time, after which a frequently used connection must be released, as soon as it is not in use. Defines after how many seconds of inactivity a connection should be released. This setting defines after how many seconds unused objects should be released. Enter the number of connections to which the pool size should be limited.